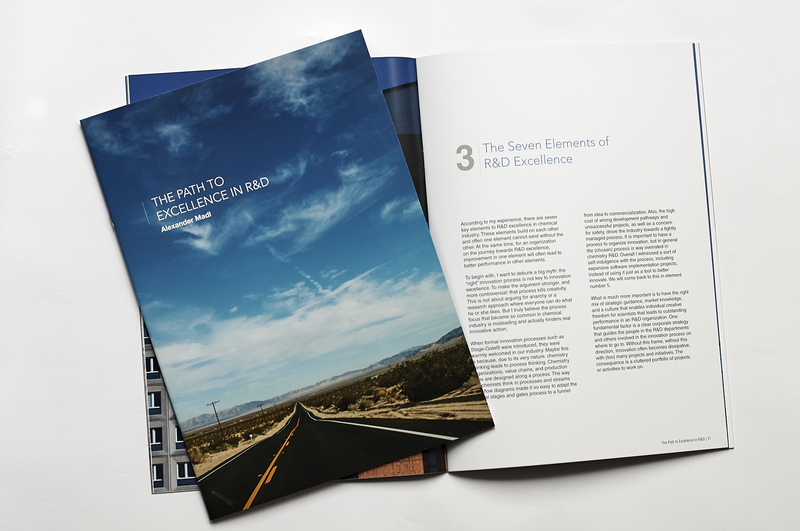 There are seven key elements to R&D excellence in the chemical industry. These elements build on each other and often one element cannot exist without the other. The elements de-focus for a process-driven innovation and focus on the right mix of strategic guidance, market knowledge, and on a culture that enables individual creative freedom for scientists which leads to the overall success of an R&D organization. Mastering these seven elements enables the organization to develop excellent returns from their investments by matching the products or services better developed according to real market needs, accelerating the development cycle from idea to market, and by succeeding in R&D projects at a higher rate than the competition. To regain the historical power of innovation, corporate R&D must innovate itself. The foundations for this transformation lay within the organizations themselves. Transformation begins when leadership is committed, organizations change, and individuals in R&D feel enabled and encouraged to do what they can do best: challenging the existing system, being curious, and connecting to the customers and their needs. In this paper, the seven elements of chemistry innovation excellence are introduced and elaborated upon. Their adaptability ensures successful implementation within any chemistry R&D organization and will set the path to transform innovation in the industry. Downlood the Ebook here for free! This entry was posted in Innovation, Publication. Bookmark the permalink.